development with our residents via tax relief." 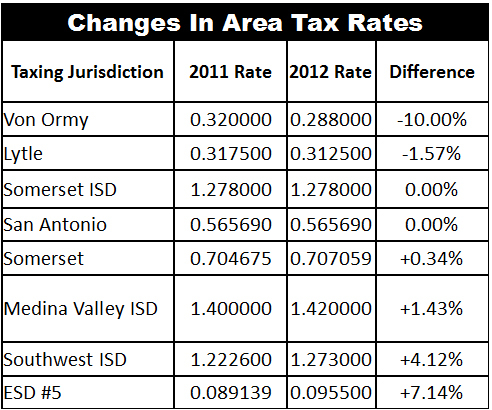 The economic upturn in Von Ormy is reflected in its rising sales tax revenue. 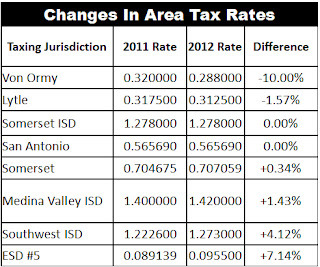 2012 sales tax receipts surpassed 2011 in September of this year, despite the temporary closure of the city’s largest sales tax producing business for remodeling. In fact, the city received the largest sales tax receipt in its history in October 2012 (for sales conducted in Sept. 2012). Due to increased activity in the Eagle Ford Shale oil field, Von Ormy is partially shielded from national unemployment rates. However, the national economic crisis is still being felt locally, most noticeably in the rising cost of everyday goods. The value of the dollar is falling noticeably due to a sharp increase in the number of dollars being printed by the federal government to pay for its massive increases in deficit spending over the last three years. gas and other necessaries. Responsive government understands the need to tax less during such times and return as many dollars as it can go into family budgets, where it can do the most good." continued construction of the new city park and a municipal building/community center. The 2013 city budget is focused on a series of building projects, particularly a municipal building, park and fire station. In preparation for a year of building, the city created a capital improvement fund in early 2012 to save for and large one time expenses. The fund was seeded with $100,00 from past city surpluses. Additionally, the City ended fiscal year 2011 with $96,000 in carry over (surplus). The city maintains additional reserves slightly in excess of a $100,000 in its emergency reserve fund.